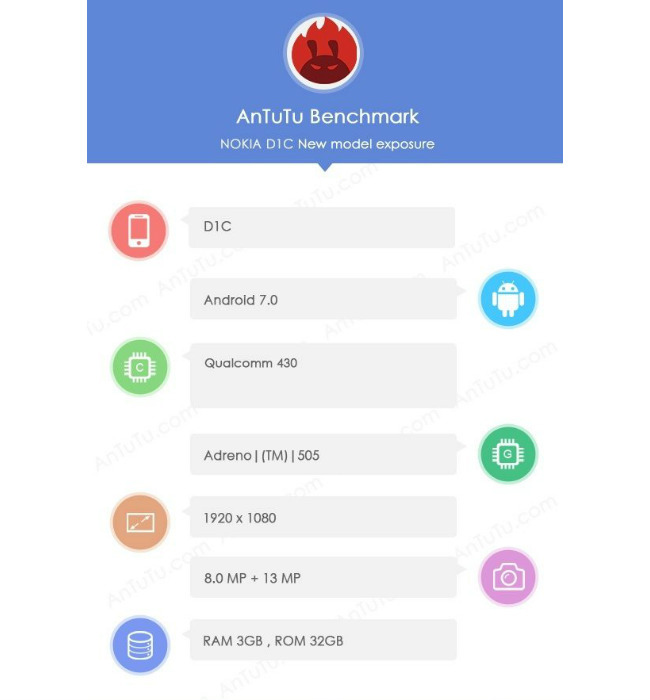 Nokia’s D1C smartphone, which was earlier listed on Geekbench, has now been spotted on AnTuTu by Playful Droid. The screenshot shared by the website shows the device to sport a Full HD display and running Android Nougat v7.0. The phone is powered by a Qualcomm Snapdragon 430 with 3GB of RAM. The device is also tipped to come with 13MP and 8MP cameras, with 32GB of storage. Judging by the specifications, it seems like the Nokia D1C may be a low-to-mid range smartphone. As mentioned before, the Nokia D1C was earlier spotted on Geekbench and the specifications match with the AnTuTu listings. The Geekbench scores of the phone were also quite close to the scores of the Xiaomi Redmi 3S Prime, which also sports a Snapdragon 430 SoC with 3GB of RAM. A few months ago, two Nokia-branded phones were leaked online. Reports suggested that the devices might come with 5.2-inch and 5.5-inch OLED displays with a QHD resolution. The company is also expected to unveil a device powered by a Snapdragon 820 SoC. To recall, HMD Global has acquired the rights to manufacture Nokia-branded phones for the next 10 years.